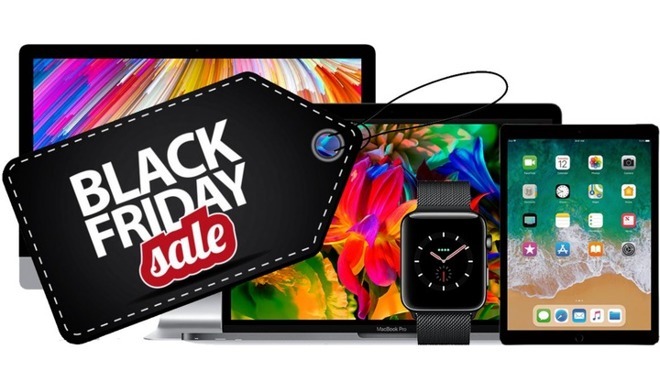 With Black Friday on the horizon, we're rounding up the best deals and lowest prices on Apple devices, and this year shoppers can save up to $1,000 on Macs from top Apple authorized resellers. Take note that since these deals are so good, very limited quantities are available and these offers may end at any time, so don't delay. First up is Apple's Late 2016 15-inch MacBook Pro with Touch Bar. Shoppers can pick up the standard model for $1,799 at B&H or opt for an upgraded model with a 2.9GHz processor and top of the line Radeon 460 graphics for just $1,899 at Adorama. At $1,000 off retail, this is the lowest price we've ever seen on the premium configuration. Both Apple authorized resellers are also throwing in free expedited shipping to the contiguous U.S. with no sales tax on orders shipped outside New York and New Jersey. Want to finance your Mac? Adorama is offering viewers no interest if the purchase price is paid in full within 12 months using the Adorama Credit Card. Up next is Apple's 13-inch MacBook Pro with Touch Bar. Viewers can save up to $250 on Mid-2017 configurations or up to $750 on remaining Late-2016 models at Apple authorized resellers this week. Prices start at just $1,649 with no sales tax collected on orders shipped outside New York and New Jersey. In addition to the offers we just listed, AppleInsider readers can find exclusive savings on just about every CTO MacBook Pro and iMac with coupon code APINSIDER at Adorama. Many models feature faster processors and/or additional storage over standard configurations. And with savings of up to $350 off MSRP, these deals on Apple's current Macs provide shoppers with the lowest prices anywhere. For a full rundown of all the deals offered by top Apple authorized resellers, including up to $230 off iPads, please visit our custom-built Price Guide. Our team has built the Price Guide from the ground up, offering the simplest and most intuitive way for finding the best deals on any Apple device for sale. If you've ever searched for the best deal on an Apple device, you know just how long it can take, and with our Apple Price Guide, it'll only take you a few seconds. Let's say you want a new 15-inch MacBook Pro, just click into the Macs category. We have every single new Mac available listed in it's own category, so let's choose the latest Mid-2017 model. Every possible configuration is listed, along with the lowest deals from the top online retailers. We let you know which deals are sold out or back-ordered, and the best deals for each configuration are listed in bold text, with the total discount shown on the right side. Don't forget to look for the green price tag tag to find configurations eligible for a coupon code or special offer on your laptop or desktop. Just click on the icon to bring up additional details, or check out the footer on each Price Guide page from a mobile device. Clicking on the green price tag icon brings up the coupon details and the link brings you directly to Adorama. With our Apple Price Guide, we do all of the work for you by finding and updating our Price Guide with the best deals available on any given day to make sure the deals are always up-to-date. Our Price Guide is permanent, so if you've got your eyes on a certain Apple device, feel free to bookmark it and check back daily to make sure you get the deal you've been waiting for. Don't forget to also check AppleInsider for flash deals and exclusive offers throughout the Black Friday and Cyber Monday weekend. We'll be posting deals on our social media pages like Twitter as well, so make sure to follow us. You can also download our AppleInsider app for iOS and turn on push notifications to make sure you never miss an outstanding deal.